Dieters aren't the only ones who put a high premium on thin and light. It's also an issue when it comes to portable computers. If you primarily plan to use a laptop at home, at the office or back and forth, then size and weight don't matter all that much. But if you're a "road warrior" who travels frequently, then an extra couple of pounds can make a big difference, especially to your arms and shoulders. I'm particularly sensitive to the weight of my notebook PC because my work requires me to have a computer with me throughout the day when I attend trade shows such as the Consumer Electronics Show in Las Vegas. Imagine the strain of carrying an eight-pound laptop through miles and miles of aisles. Of course, it's possible to make computers very light and tiny. Microsoft co-founder Paul Allen bankrolled the development of a one-pound mini-PC that fits in your hand and runs Windows XP. The FlipStart (flipstartpc.com) is expected to cost about $2,000 when it hits the market later this year. The trouble with the pocket-sized PC is that it has a tiny keyboard and screen and, of course, no built-in CD or DVD drive. But not all ultra-light portable PCs are pocket-sized. There is also a cadre of machines that are quite thin and light, yet pretty close to full size. IBM has long been a leading player with its ultra-light ThinkPad X series and the company recently refreshed its line with the X40 that is 20 percent smaller and 25 percent lighter than its previous models. The unit weighs 2.7 pounds and measures 10.5 by 8.3 by .81 inches, making it one of the lightest and thinnest machines on the market. Like all ThinkPad computers (but unlike some competing ultra-lights), it has a terrific keyboard - with the same distance between keys as a desktop or full sized notebook PC. That's important to touch typists who are accustomed to a certain keyboard layout and are likely to make mistakes if the keys are smaller or closer together. 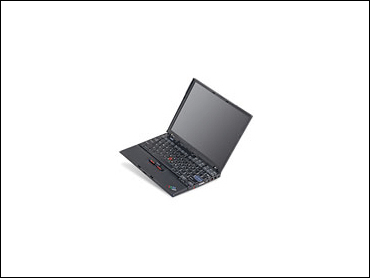 Like most ThinkPad models, the X40 uses the TrackPoint pointing device rather than a touch-pad. That's the little stick that looks like a pencil eraser that sticks up between the G, H and B keys. Some people hate the TrackPoint while others - myself included - prefer it to the touchpads that are used on most other notebook PCs. It's one of those personal preferences that can easily dictate what machine you wind up buying. The X40's 12.1 inch (diagonal) screen is definitely smaller than the screen on many full-sized laptops but before you bemoan the smaller screen, remember that this device is for people who value mobility. I actually prefer the smaller screen when I'm on a plane because it fits more easily on the tray table - especially when I'm flying coach. The last thing I need is for a large screen to get broken when the person in front of me suddenly decides to lower the seat. The big drawback of the X40 and most other ultra-light notebooks is that it lacks an optical (CD or DVD) drive. I have become accustomed to traveling with a laptop that has a DVD/CD combo drive that I can not only use to load software, but also to watch movies on the plane. IBM has two strategies for people who need an optical drive. One is an external USB 2.0 "portable multi-burner drive" that reads and writes both CDs and DVDs. At $499, it's not cheap, but it weighs only .6 pounds and is very slim. Another option is to purchase a dock that clips to the bottom of the unit. The ultrabase dock, along with the CD-RW/DVD-ROM drive adds $400 and 1.9 pounds to the unit which brings the total weight to about 4.6 pounds. That's comparable to lightweight notebooks with built-in optical drives and IBM's implementation is quite good. The drive clips solidly to the ThinkPad making it look and feel like a fully integrated unit. The X40 has a built-in WiFi adapter which makes it a cinch to connect to wireless networks. It also has a standard Ethernet (wired network) and modem jack. IBM also equips these new models with its new "active protection system" which is like an air-bag for notebooks. If you drop the machine, the hard drive is less likely to lose data. At least that's what they tell me. I didn't drop test my loaner machine. Although never deliberately, I have dropped notebook PCs in the past and, even if the hard drive survives, the case or screen usually breaks. The ThinkPad X40 costs $1,500 but, by the time you add a portable CD or DVD drive, your cost will hover around $2,000 which is about twice as much as the least expensive but much heavier DVD-equipped laptops. When it comes to portable computers, less is more.